The twice-annual Outdoor Retailer trade show, this summer in Salt Lake City, Utah, August 3 – 6, is a peek at the future of gear. The items displayed on the trade-show floor are what you’ll see at shops this winter and in the spring of 2011. Below is an early preview, a couple scoops from Gear Junkie and my moles in the outdoors space. Super Light Tent. 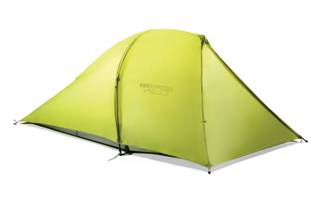 England’s Terra Nova Equipment has reached new lightweight horizons with its 1 pound, 1 ounce Laser Ultra 1 tent. 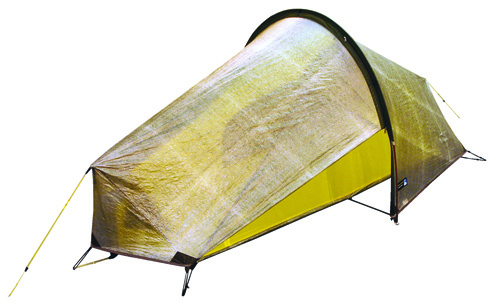 It’s made for one person and is touted as “the lightest double-wall tent in the world.” (The two-person Laser Photon 2 weighs a smidge more at 1 pound, 15 ounces.) There are literally trail-running shoes that weigh more than this tent! Pump-Up Camp Pad. 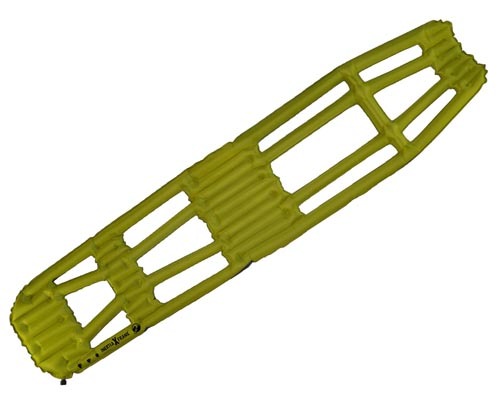 The Klymit Inertia X Frame, $99.95, packs down to the size of a soda can. 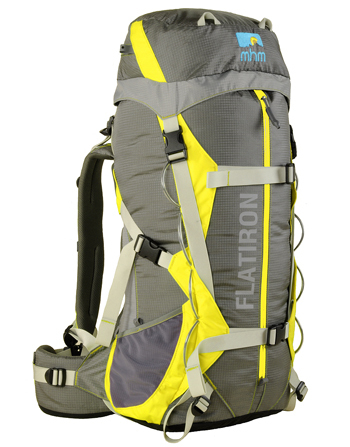 It inflates with normal air or a C02-like cartridge gun from Klymit that pumps in insulating argon gas. Weight: 9.1 ounces. Length: 72 inches. Width: 18 inches. Made from rip-stop nylon and “body-mapped” to support a sleeping frame. Human-Grade Dog Chow. 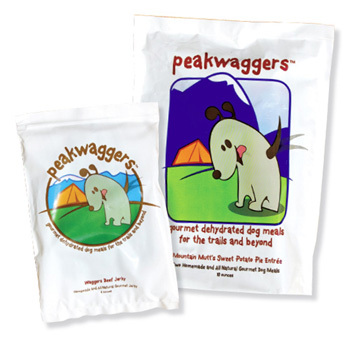 Promoting “gourmet jerky and dehydrated trail food” for dogs, PeakWaggers’ canine line is homemade, all-natural and organic. The fancy and trail-ready puppy chow comes in vacuum-sealed bags. Flavors include Chicken Pawmesan, Barkin’ Beef-Barley Stew, and Dog-Gone Cottage Pie. The kicker: Because all the ingredients are “human grade,” a hungry hiker can literally share a meal with Fido in a time of dire need. Endurance Vest. 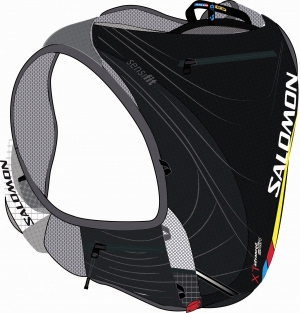 Called an “endurance running vest,” the XT Advanced Skin SLAB product from Salomon is essentially a form-fitting hydration pack. It’s made for “intense trail running” and ultras. Its meshy, minimalist design holds a water bladder and small essential items like energy food and an extra clothing layer or a light shell jacket. There are no buckles or straps to prevent chafing. Comes with a 1.5-liter water bladder. Weight: 1 pound, 6 ounces. Capacity: 305 cubic inches. Bro Packs. In an attempt to make backpacks that will appeal to a younger crowd, Jeff Popp and Jordan Vecchiarelli — both 24 years old — have launched Mile High Mountaineering. The Denver-based outfit has three backpack models, all with a “fresh, bright, and clean design,” as the company puts it. Tech attributes include side-loading sleeping bag compartments, a “back-hugger” internal compression system, and what is said to be “one of the best dual-pivoting/adjustable cant hip belts available” on the market. Sit-On-Top Kayak. Necky has produced its first sit-on-top kayak in nearly a decade. 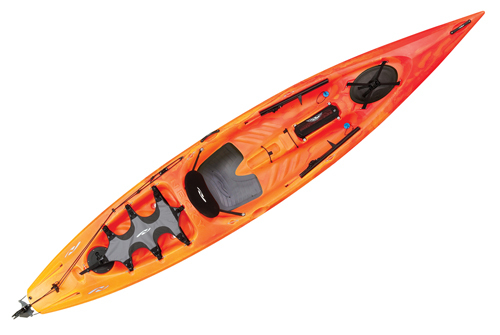 The Vector 13 model is advertised to blend the comfort and stability of a sit-on-top with the efficiency and performance of a touring kayak. The company says the Vector 13’s seat was made to reduce pressure on the sciatic nerve and prevent the leg and foot fatigue often associated with paddling long distances. The boat is 13 feet long, 29 inches wide, and it weighs 59 pounds. Available in August starting at $899. Tecnica Trail Runner. 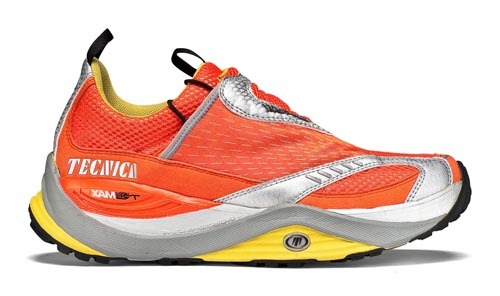 Tecnica Outdoor has entered the trail-running category with a technology called TRS Max. It addresses stability, absorption and propulsion of the shoe. The claim: Wearers will be able to “surf downhill and roll uphill with maximum efficiency.” How’s it work? TRS, Tecnica touts, improves energy transmission and comfort with greater toe and heel rocker height. The TRS footprint is also much larger than traditional trail-running shoes. Inferno Max model, $150, shown here. Easton Ultra-Light. Touting a “never-before-seen carbon pole system,” Easton Mountain Products’ Kilo Tent weighs less than 2 pounds (about 31.7 ounces, including its poles). Easton says its techy poles are 56% lighter than comparable aluminum poles. $399.99. Wrap-Around Pack. Bear-proof food canisters are becoming mandatory in many wilderness areas. 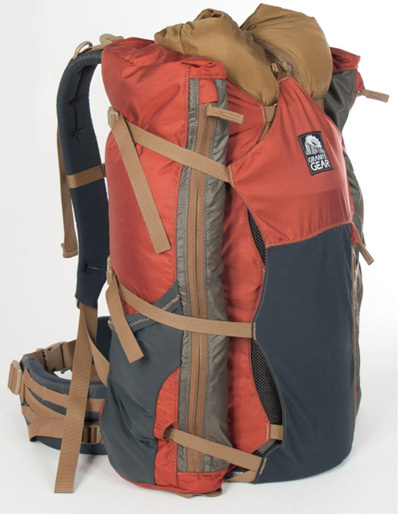 Granite Gear’s latest, the Nimbus Core backpack, targets that market with a new design, including a large opening on back and side pockets that wrap around the pack’s core. It fits a large bear-proof food canister. Recommended for loads up to 40 pounds. Pack weight when empty is 3 pounds, 12 ounces. iPad in the Outdoors. 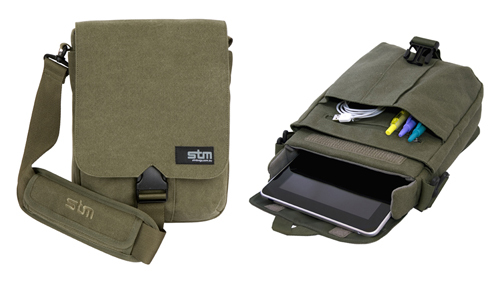 Australia-based STM Bags’ Scout shoulder bag is a slim case designed for the Apple iPad. It has an outdoorsy aesthetic and is made of canvas. There is protective padding and a felt lining inside to surround digital gear. The Scout bag works with the iPad and most 11-inch laptops/netbooks. Tri Suit. Wacoal Sports Science touts that it has been issued more than 50 international patents for the anatomical CW-X apparel line. Two new CW-X products, the Ventilator Stabilyx Tri Shorts ($85) and Ventilator Web Tri Top ($75), are made for triathletes — they can be worn for an entire race, no changing required. A lightweight fleece chamois bike pad, UPF 50+ sun protection, and a flexible “support web” of fabric — to assist posture, breathing and arm movement — are attributes marketed with the versatile line. Genuine Fleece Top. Polar-fleece tops are old standbys for many outdoor enthusiasts. But much of the “fleece” on the outdoors market is not fleece at all — it’s really petroleum-based clothing. 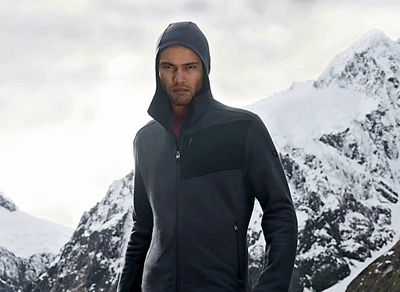 New Zealand merino-wool company Icebreaker, for its fall 2010 line, debuts a bonafide fleece top. Made of wool, the company’s RealFleece is literally off the backs of merino sheep in New Zealand’s Southern Alps. It ain’t cheap, though. One RealFleece piece, the Men’s Aspiring Hood top, will cost $200. FiveFingers Expansion. The “barefoot evolution” sprints on! 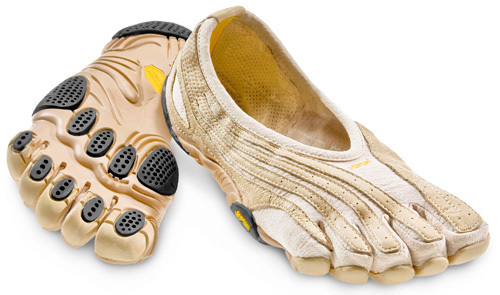 Vibram FiveFingers’ 2011 line expands with a new road-running collection (it has an off-center lacing system and a new type of sole), a men’s and women’s fitness shoe, and a — dare we say? — model for fashion and everyday use. Also of note: In 2011, Vibram will be launching its first-ever FiveFingers children’s line. Belt With Small Pockets. 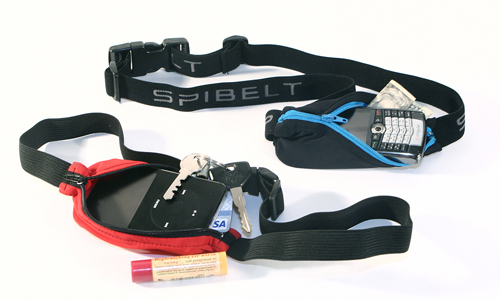 It’s called a SPIbelt, the “SPI” standing for “small personal items.” While it debuted in 2007, the makers of the SPIbelt — which is designed to hold IDs, MP3 players, cell phones, keys, money, credit cards, insulin supplies, and other must-haves while running or outdoors — keep innovating the small pocketed belts. It now comes in 22 styles with varying pocket configurations and color schemes. The company pits its stuff-stowing belt against the time-tested fannypack category, calling the latter “cumbersome.” Fannypacks versus SPIbelts! We are on. Clif Granola Bars. The culinary category formerly know as “energy food” has taken a big turn for the better in recent years. Clif Bar & Company diverges from the category altogether with its CRUNCH line of granola bars. They are like Nature Valley granola bars, coming two to a pack and made of dry/compressed granola-type stuff. But, lo, these are good tasting. I tested the White Chocolate Macadamia Nut variety and can officially say Yum! It has a great sweet-but-not-too-sweet flavor and a cookie-like aftertaste. It doesn’t taste like any “energy food” I’ve ever eaten. Downfalls? They might crumble big time in a backpack on the go. Dog Boots. The Polar Trex Dog Boots from Ruff Wear offer winter traction as well as warmth. 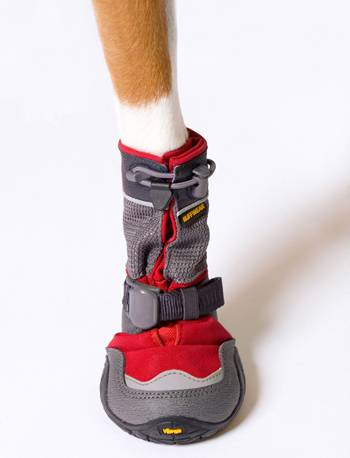 The insulated dog shoes are made of a soft-shell weather-proof fabric and a reinforced gaiter for leg protection. The sole comes from Vibram and includes a “snow-gripping” lug pattern for canine momentum on frozen ground.